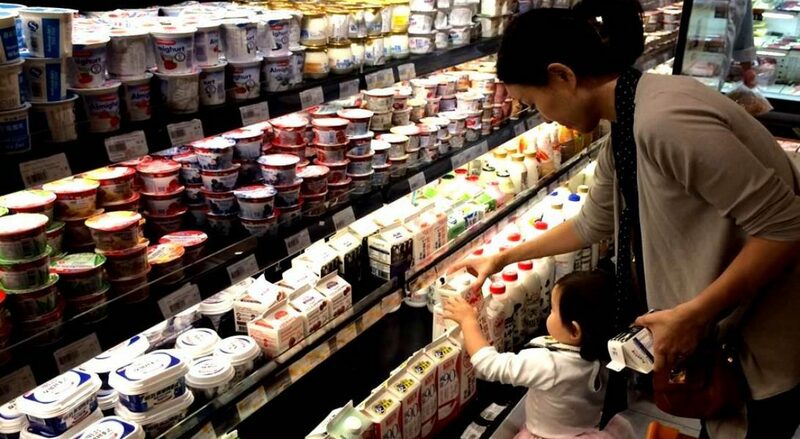 We all know that Chinese consumers are quickly moving towards “healthy” food products, meaning food products that can be beneficial to a healthy life style, to counter-balance their stressing life in polluted and fast-paced huge megalopolis. Despite several experts in nutrition do not consider juices to be per se a healthy food – they lack fibers while providing easy-to-absorb sugars – fruit (and veggies) juices are amongst the fastest growing segment in China’s food industry; the drive is even faster for “naturally”-processed (if we can ever use this kind of expression…) ones. Claims are becoming a key tool for the marketing departments of juice companies; so we took a look at what strategies some companies use to market their products and give some comments from our point of view. This company chooses function claims referring to Vitamin C: “Vitamin C could facilitate the absorption of iron”; “Vitamin C has anti-oxidation effects”. These claims are eligible since the content of Vitamin C exceeds 15% NRV (as we can see from the nutritional label). We also have a statement that “250ml contain 437mg anthocyanins”. Anthocyanins content in food is not regulated, and actually here we do not have any content claim (such as: rich of anthocyanins, source of, etc…) nor any function claim for anthocyanins. So, the anthocyanins claim is basically relying on the general rule whereby it is allowed as long as it is absolutely true (meaning: the anthocyanins content is exactly as indicated on the label). Now, because anthocyanins content is not covered by nutritional standards, basically no error margin is allowed – meaning that on principle the brand here needs to make sure that each bottle contains exactly that amount of anthocyanins. Another relevant point of marketing is the product name, as it appears on the label: “100% black berries compound fruit juice”. 100% claim in fact is regulated and therefore allowed for this product, on the assumption that it satisfies the requirements for such claim. Ingredient list also mentions “originally squeezed apple juice” (“originally squeezed juice” is a regulated definition) as well as “original puree” of other fruit (the notion of “original” is not formally regulated for fruit puree; however, as the definition of fruit puree includes both reconstituted and not reconstituted fruit puree, “original” here might be used to specify that non-reconstituted fruit puree is used as ingredient). This juice (mixed of fruit and vegetables fruit) claims that “Chinese Dietary Guidelines [issued by Chinese Dietary Society in 2016] recommend a daily intake of 300-500g of vegetables and 200-350g of fruit”…. “I contain: 144g of vegetables juice and 118g of fruit juice”. In theory, reference to Chinese Dietary Guidelines can be considered a rather smart way (yet so seldom used…) to access to claims otherwise forbidden or border-line. In fact these Guidelines can be considered an official document – although not a regulation – and include opinions and recommendation on diets, as well as comments and statements on beneficial effects of certain foods on the human health. In this specific case, however, despite the correct “journalistic” approach (the statement simply reports that these Guidelines contain this recommendation), we have to observe that these Guidelines contain also another recommendation (which this labels “forgets”) that “fruit juice cannot replace fresh fruit”; this potentially exposes this claim to the risk of being considered misleading (and therefore considered as false advertising under Advertising Law). How will future (food) look like?